News this morning has emerged that an Arctic Medal, in the possession of the Stromness Museum in Orkney, has been identified as Sir John Franklin's own medal. Certainly, if that's accurate, this modest token would almost at once become the most valuable and significant medal of its kind. One which came to auction a few years ago -- that belonging to Lieutenant John Irving -- sold for $60,000, and there's every reason to believe that Franklin's own medal would be worth many times that. To Willingham Franklin Rawnsley, from his affectionate Uncle and Godfather, on the day of his baptism, 23d March 1845, John Franklin. Search the scriptures. Pray with spirit and with understanding also. This very infant, as fate would have it, grew up to compile a life of his great-uncle's wife Lady Jane, which was published in 1923 when he was seventy-eight. The Rawnsleys thus had rich reasons to remember Sir John -- which thus connects them with a slip of paper, formerly adhering to the medal, with the initials F.A.R., thought to be those of Francis Anna Rawnsley. The medal remained in the Rawnsley line, and was brought to the Stromness Museum by Rosalind Rawnsley, so the line of provenance is entirely plausible. Unfortunately, no correspondence or family mention of the medal survives, so the line is still somewhat conjectural. There is one other bit of evidence -- a reference to Franklin's medal missing its eyelet and ribbon, which also matches this exemplar. It's also worth noting that the medal is not mentioned in any of the documents associated with Sophia Cracroft, Lady Franklin's niece and one of the executors of her will, and thus was not among the many Franklin-related items from her estate which passed to the Scott Polar Research Institute in the Lefroy Bequest. Absence of evidence is not evidence of absence, of course -- but here it at least does not contradict the conjectured transmission of the medal to the Rawnsleys, though it suggests that it more likely happened before Lady Franklin's death. If so, the gift was surely made in the spirit of the strong bonds of affection which linked Sir John to the family -- and so, in any case, makes this medal one of unusually significant historical interest. 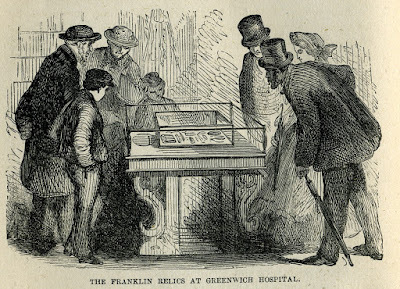 Some one hundred and fifty-eight years ago, the British public were drawn with awe and reverence -- along with not a little idle curiosity -- to Greenwich Hospital, where, in glass cases sorted by type, there lay a strange and compelling array of what had once been ordinary objects: eyeglasses, forks, spoons, bits of uniform cloth, cigar cases, cap-bands, and dozens of books. 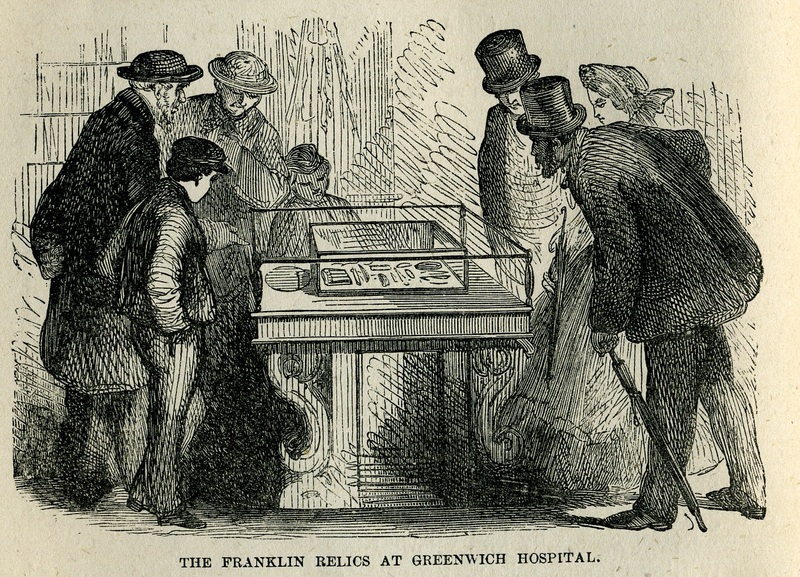 These items, so unremarkable without their strange provenance, were the last material effects of the once-vaunted Arctic expedition led by Sir John Franklin, which had sailed past the very grounds of that hospital, waved on by cheerful crowds, a mere fourteen years before. At every point of the dread pilgrimage from this world to the next, some domestic trace remains that appeals tenderly to the memory, and that leads us on, from the day when the last illness began, to the day that left us parted on a sudden from our brother or sister-spirit by the immeasurable gulf between Life and Eternity. The sofa on which we laid the loved figure so tenderly when the first warning weakness declared itself; the bed, never slept in since, which was the next inevitable stage in the sad journey; all the little sick-room contrivances for comfort that passed from our living hands to the one beloved hand which shall press ours in gratitude no more; the last book read to beguile the wakeful night, with the last place marked where the weary eyes closed for ever over the page; the little favourite trinkets laid aside never to be picked up again. And now, in 2017, a great many of these relics will be seen again, re-united, as it were, with others whose trail through time took a different course: left behind on Franklin's ships, dropped from the weary hands of the last few survivors as they trekked over land, or excavated by archaeologists. 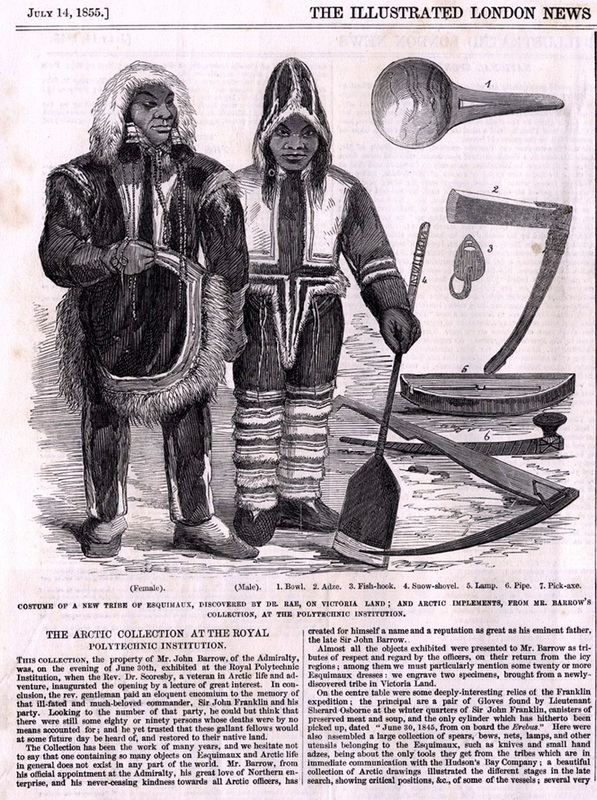 Adding immediacy to the tale of woe of those last few stragglers, we have also the oral traditions of the Inuit, as recorded by those who searched for Franklin, illustrated by objects the Inuit repurposed for more practical use. And, in the innermost of sanctums, casts of the bones whose incised cut-marks verified the most difficult and distressing news of all: that the last few men, in the words of Dr. John Rae who conveyed the Inuit accounts, had turned in their desperation to the "last resource." There is a strongly positive message here as well, though, and it's not the usual one about England's brilliant naval accomplishments. It's the Inuit testimony itself that guided modern searchers to his ships, the testimony of those who such men as Dickens derided as "the vague babble of savages." Whether in archival manuscripts, such as those of Charles Francis Hall, or in modern accounts, such as Gjoa Haven resident Sammy Kogvik's story of a strange wooden post in Terror Bay, it was the Inuit who led the way to where the lost lay low. It's my personal hope that, with the story now told in its fullest dimensions, people from the UK and around the world will come to appreciate not simply the tragedy of Franklin's expedition, but the story of intercultural understanding and co-operation that led to the unravelling of one of the great mysteries of all time. NB: The exhibit, Death in the Ice, opens at the National Maritime Museum in Greenwich on 14 July; it will appear there through the rest of the year, after which it will be shown at the Canadian Museum of History in Gatineau beginning in March of 2018.